To calculate the distances between the ligand and a particular amino acid of a given protein using PyMol. Proteins are important biological macromolecules, usually considered as fundamental units of a cell, play a vitally important role in different cell functions. Protein functions are very specific and mostly depend on the molecule to which it binds. All proteins are made up of long chain of amino acids that fold into 3D shape. Protein structure is classified into primary, secondary, tertiary and quaternary. Primary structure is linear arrangment of amino acids in the form of a chain which fold into secondary, tertiary and quaternary structures. Amino acids are organic compounds that contain hydrogen atom, alpha carbon, two functional groups and a side chain R group. Nearly 20 amino acids were found in human body which only vary in their R groups. Amino acids are linked to each other with the help of peptide bond. Peptide bonds are formed when the carboxyl group of one amino acid linked to the amino group of another molecule through a covalent bond. Proteins exhibit their biological functions by interacting with other molecules called Ligands. Ligands are small molecules which have binding affinity with receptors. Ligands and their binding sites can be characterized in terms of binding affinity. High affinity ligand binding interaction is due to greater intermolecular force between ligand and receptor, low binding interaction is due to less intermolecular force between ligand and receptor. Protein and ligand binding is a spontaneous reaction. Multiple weak interactions can lead to strong interaction between ligand and protein. Ligand binding sites can be regarded as functional units of proteins. Hence, the protein interactions are mediated by specific amino acids present in the protein. PyMOL is Copyrighted © software DeLano Scientific LLC, San Carlos, California (U.S.A.). It is free for all to use, modify, and redistribute. Warren Lyford Delano, developed the interesting molecular visualization tool PyMol, which has been regularly used by crystallographers (who finds out the macromolecular structures through the technique crystallography). In many journal papers (research papers), we can see the structural images created using PyMol. Users can get high quality images and animations of biological macromolecules like proteins. PyMol is freely available, since it is an open source visualization tool with python (programming language) interpreter. This visualization software have inbuilt demonstration of what it does (Figure 2). To see the demo, go to the standard menu bar, select the wizard menu, from the submenu select demo with representations. 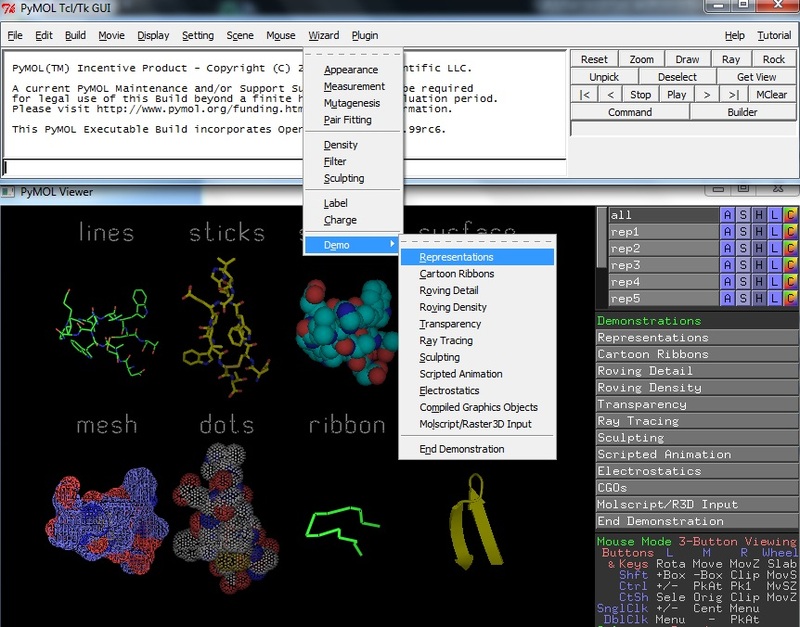 PyMol is used to visualize the .pdb files, which are mostly available from the protein databank. It contains structures extracted from techniques like x-ray crystallography, NMR Spectroscopy. With the help of initial experimental data, the structural biologists use these techniques or methods to determine the location of each atom relative to each other in a molecule. The x-ray crystallography has x- ray diffraction pattern data while NMR spectroscopy contains information of local conformation and distance between the atoms that are close to one another. In x-ray crystallography the protein is purified and then crystallized, which is then treated to x-ray beams. These crystallized proteins are analyzed to get the distribution of electrons in proteins, by diffracting the x-ray beams into one or other characteristic pattern of spots. After we get the distribution of electrons, it hel determine the location of each atom. In NMR Spectroscopy they use, strong magnetic field to determine the protein structure. The protein is purified and subjected to strong magnetic field which is then probed with the radio waves. Thus we can observe the resonances, which can be analyzed to give the list of atomic nuclei that are close to each other. This list is used to build a model of protein that can show a location of each atom.